#Saisonspende has taken Germany and the Bundesliga by storm in a beautiful show of the power of football. Sometimes, the 140 characters of a tweet can have an impact well beyond the realm of social media. And in the Bundesliga, at the start of the 2017/18, fans have shown exactly how powerful they can be. "For every goal that Leonardo Bittencourt scores this season, I'll donate €21 to a children's charity," tweeted Sarah Knoll, a Cologne fan whose example has since been followed by a wealth of other fans from a host of Bundesliga clubs under the hashtag #Saisonspende (#donationseason). "I didn't really count on that. I'd hoped a few people would join in, but the fact hundreds are participating is simply astonishing," said Knoll, 21, whose inspiration for the idea came from Twitter itself. "There are always individuals who say they'll donate something based on their favourite team's results. I stumbled upon such a tweet and the idea came to me. Only this time with the hashtag #Saisonspende, that's the key to it having become so big." The fans are not the only ones who are enthusiastic. "Great stuff!" tweeted Bittencourt. "My contribution: as many goals as possible! And at the end of 2017/18, I'll round it up." The response from Cologne's 23-year-old schemer brought a smile to Knoll's face. "Leo Bittencourt's reaction made me so happy. But I was just as happy with the others, as happy as on 20 May when Cologne ensured qualification for the Europa League." Bittencourt is not the only Bundesliga player to have taken up the #Saisonspende cause: team-mate Simon Zoller has also gotten involved, adding €50 for every goal he scores with the money going to the 'Arche Köln' children's charity. In Bremen, where the fan community worum.org is trying to raise awareness of the initiative, Werder defender Theo Gebre Selassie has promised to add €10 for every goal he scores with donations going to the Robert Enke Foundation. "The success of the initiative shows that football fans, independent of their clubs, can do great things together. And that makes me really quite proud," explained Knoll. Not that the clubs are standing by and letting the fans do all the work. 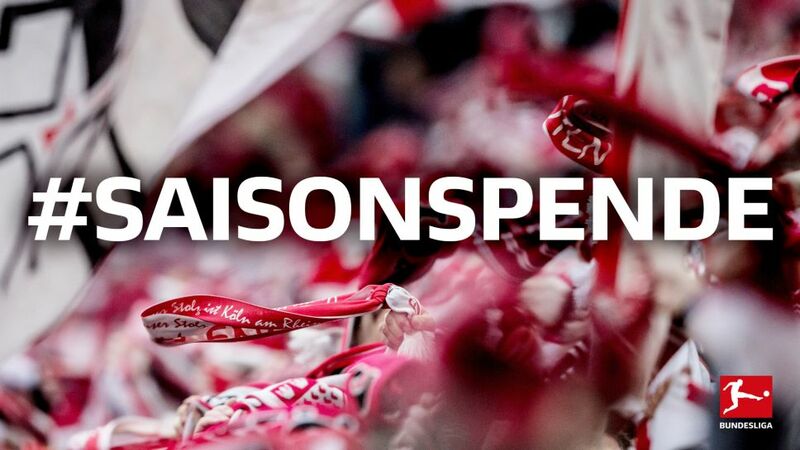 While Cologne are promoting #Saisonspende via Twitter, Stuttgart are digging into their pockets. "We're getting involved in #Saisonspende! For every kilometre run by Stuttgart players in the 2017/18 Bundesliga, there'll be one euro for social projects," they stated on Wednesday, giving the cause new momentum. It means the three-time Bundesliga champions have already pledged €112.7 after their squad's efforts against Hertha Berlin on Matchday 1. All those giving are united in one wish: to help people through football. That is also the case of the DFL Foundation, which has been working for young people, in particular, since it was created in 2008, promoting integration and participation as well as a healthy lifestyle. It complements the local commitments of the Bundesliga and Bundesliga 2 clubs, and initiates nationwide programmes with the support of partners and through the use of its extensive networks. Third-party initiatives are also supported as long as their aims fall within the Foundation's objectives. In addition to this, the DFL Foundation uses the social and media reach of professional football and its role models to bring socially relevant issues to the fore. It is the perfect foil to the efforts of the fans who have committed to #Saisonspende. For Knoll, it will give a special flavour to a Bundesliga season that promises to be memorable for many reasons. "I'm very proud," she said. "This season will be the end of the initiative, but I hope it won't be a one-off and that next season there will again be a lot of fans who are ready to make donations." Click here to read more of the latest Bundesliga news!